Mode Change: I find the mode change in the TLT5 to be difficult at best(due to my skinny lower legs). The cuff buckle on the Spitfire is shorter, so there is less leverage for making it tight. Going from ski to climb mode is VERY easy and fast. This is a huge improvement over the TLT5 design. However, as stated above, the exoskeleton can remain caught for a few strides. This does not seems to impact the acute angle movement, but the cuff will not lean back until this works itself out. I think a stiffer spring in the exoskeleton may help with this issue. Changing from climb to ski modes in unfortunately significantly less smooth. I find it to be about the same frustration level and difficulty as the TLT5 climb to ski transition. It takes considerable force for me to move the cuff lever back. This is due to a few different issues. The first is that the velcro strap can get caught on the cuff which needs a little fiddling to clear the obstruction. I believe this could have been solved pre production easily. Either by redesigning the opening to make it larger and give greater clearances, or moving the location to be entirely within the velcro area(it gets caught because there is a portion where the velcro folds over a metal clasp and that hangs up on the cuff. So shortening the metal clasp would possibly alleviate this issue, or otherwise streamlining the transition). The other hangup is that unless you have the cuff at the locking angle there is significant additional force needed to move the cuff buckle throw. There is very little leeway here and it is unfortunate since some boots seem much more forgiving(you can throw the buckle at any cuff angle, then when the cuff gets to the correct lean angle it locks in, this is ideal in my opinion). Overall I feel like the boot engineers should have spent another month working on this mechanism as this is the weak point of the boot. Also to note, while I found issues with the Syborg mode change mechanism, there was no significant force involved to change modes in either direction and no hangups. I was hoping for such a smooth mechanism in this boot as well. Durability: While I haven't taken these boots outside there are some general expectations of durability I feel you can glean from handling the boots for an hour or so. I feel more confident in the durability of the cuff than the TLT5P. My TLT5P cuff has significant chips in it at this point(bought used with minimal wear, ~150 days after that, ice climbing, rock scrambling, etc). The Spitfire cuff is a carbon reinforced polymer(PA12 nylon + carbon fiber) where the TLT5P appears to be a standard carbon weave layup in epoxy. The Spitfire uses pivot rivets very similar to the TLT series, so there may be slop issues, but it's hard for me to say at this point. The exoskeleton seems to be the weak point with this boot. I fully expect a season of hard use to cause issues with this mechanism. I expect the spring to lose effectiveness over time, which will make the mechanism cease to function, I expect the exoskeleton to get caught on something and get tweaked to the side, I expect the aluminum exoskeleton to get notched from use where it mates to the steel pin, causing further difficulty with mode changes. Overall: I was hoping this boot would be the holy grail. I had tried the Syborg and other than an overall lack or mass and stiffness I found it very promising. 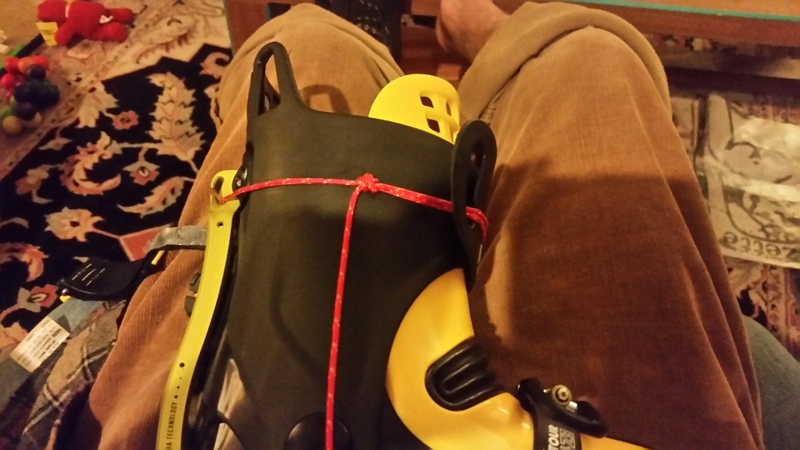 I expected that this boot would take the Syborg into the realms of a 'real' ski mountaineering boot. 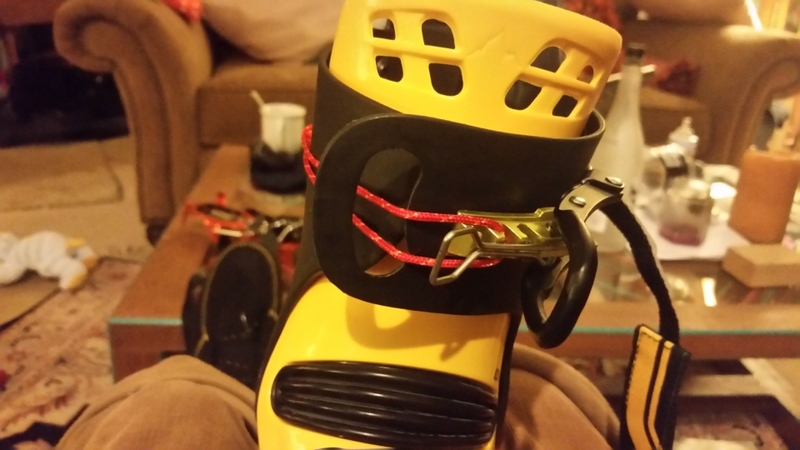 A boot which would be able to tackle steep, technical skiing(45-60 degrees), climb ice and rock, be able to drive skis 105 underfoot with ~'enough' control and be fast enough for citizen skimo racing for a one boot quiver guy. I do feel like the boot will do well for the downhill skiing portion of the equation, but I doubt it's durability when put to the test climbing ice and rock, and the fast mode changes just aren't anywhere near a citizen skimo race boot. Compared to TLT5P without tongue: Climb mode is much better. More and smoother range of motion. 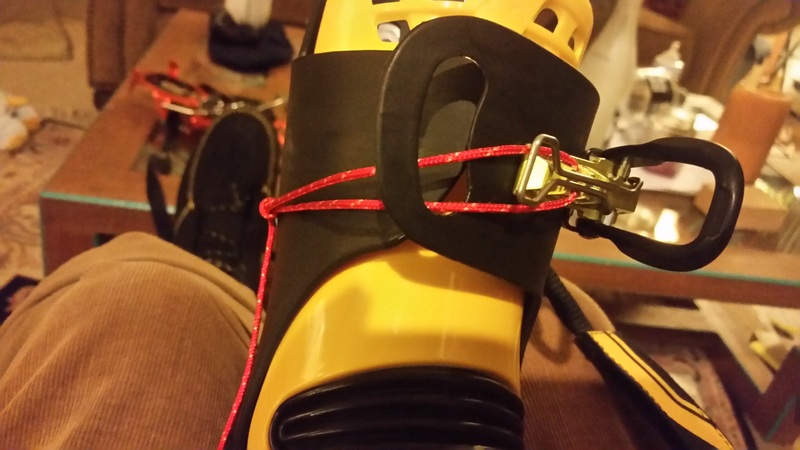 Ski mode is better, I can get the cuff tighter and feel I will have better control. Instep buckle is hugely improved over stock, and even better than my modification. Transition to climb mode is hugely better, transition to ski mode is marginally better. For rock and ice climbing durability I would trust TLT5 more. The failure mode for TLT5 seems less severe than the Spitfire and less likely. Compared to Syborg: Climb mode is slightly worse, not a significant difference for my uses. Slightly less range of motion. Less ingress for snow in stock configuration. Ski mode is significantly better. 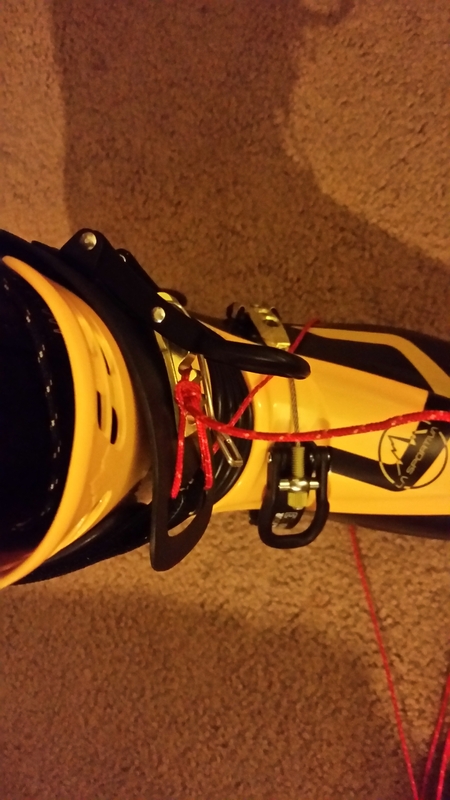 The cuff is much stiffer and overall the boot feels confident enough for 105 underfoot skis. Syborg feels like 90 underfoot will be pushing it and difficult to control. Instep buckle is better. Transition to climb mode is slightly worse(didn't catch on the Syborg), Transition to ski mode is significantly worse(was VERY easy on the Syborg). I expect spring strength issues on both, exoskeleton durability issues on both. 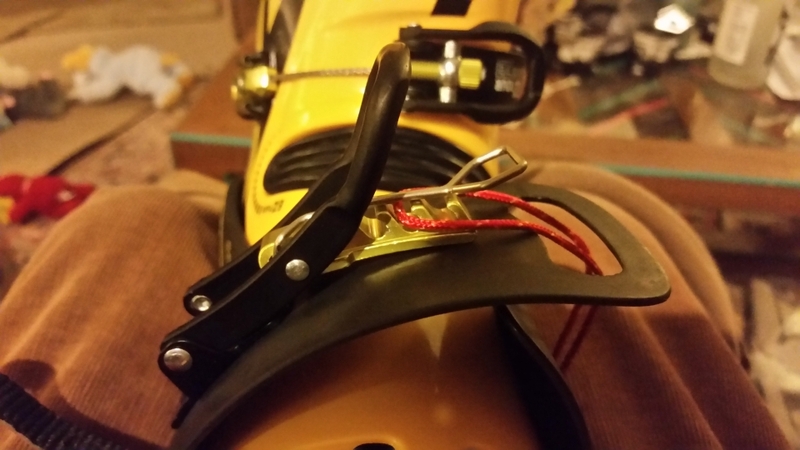 Crampon Fit: I tried on my BD Neve Pro crampons and they feel very secure. 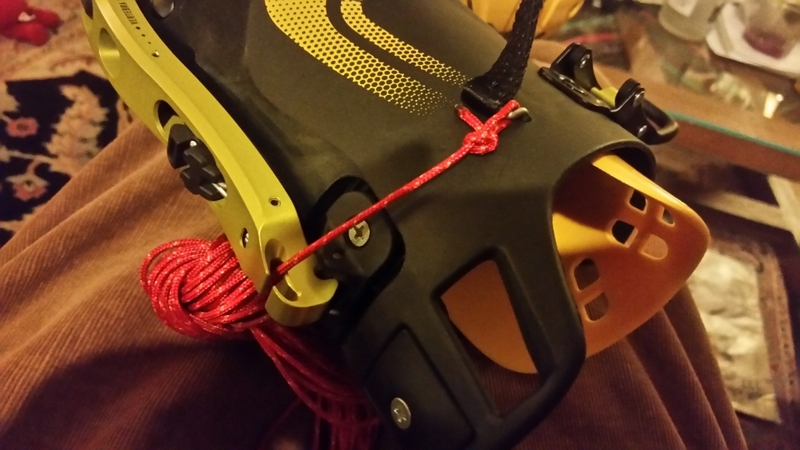 The rear throw doesn't block any function, but I generally wrap the strap a full time around my ankle before securing it. If I were to do that here it would force the boot into ski mode. 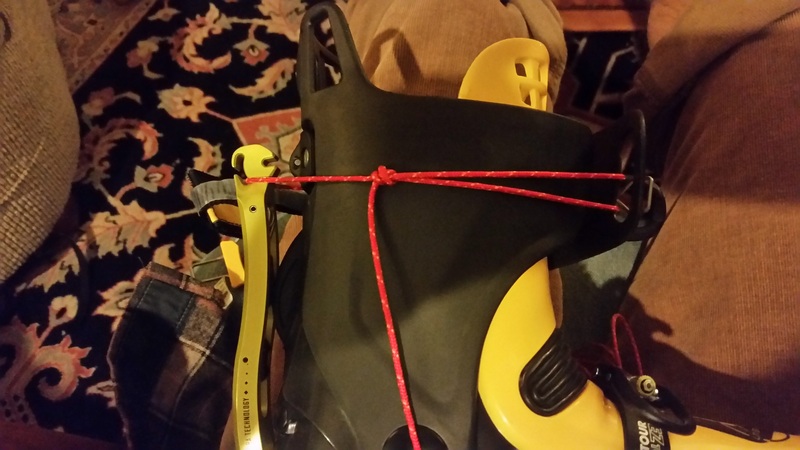 However it is easy and just as secure to just go around the front of the boot. The toe bail doesn't match the profile of the boot perfectly, but the two points of contact it does have is very secure feeling. Mode Change: After looking at the mechanism more deeply I found that most of the difficulty with the buckle throw came from the metal loop at the end of the velcro strap. The cuff has a hole cut into it which the strap and metal loop pass through, and the hole is slightly too small for the metal loop to pass unobstructed. This presents just enough of an obstruction to make throwing the buckle a PITA. I tried two different solutions and found that replacing the metal loop with a loop of dyneema cord(and alternatively replacing the entire velcro strap with a length of dyneema cord) made the lever throw significantly more smooth and easy. It is unfortunate that a $900 boot requires this much modification out of the box, but I'm thankful that it was this simple to improve the mode changes.